Weston is a suburban community in Broward County, Florida, United States. Established as a city in 1996, much of the community was developed by Arvida/JMB Realty and is located near the western developmental boundary of Broward County. It is the most western city in Broward County, and its entire west side is next to the Everglades. As of the 2010 census, the city had a total population of 65,333. 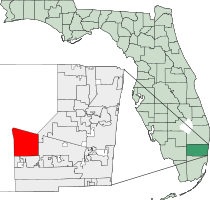 Weston is part of the Miami–Fort Lauderdale–Pompano Beach Metropolitan Statistical Area, which was home to 5,564,635 people at the 2010 census. The city is nicknamed Westonzuela by many, due to the city's large and affluent Venezuelan community. An 8,000-year-old paleo-Indian and Tequesta Indian burial mound is located in the city. In 2010, Money magazine ranked Weston 19th in America in the "Biggest Earners" category, with a median family income of $119,689.In 2006, it was ranked as the city with the largest job growth in Florida and 18th largest in the nation.BusinessWeek ranked Weston as one of the "best affordable suburbs" in the United States in November 2006. Weston consistently ranks high annually in CNN Money magazine's "Biggest Earners" category. In 2008, Money magazine ranked Weston as the 73rd best place to live in America, making it the best place to live in the state of Florida.In 2012, Weston moved up eleven slots to the 62nd best place to live in America, once again topping the list in the state of Florida. South Florida winters are usually dry and warm during La Niña conditions, while El Niño conditions usually bring cool and wet conditions to the region. ENSO effects on South Florida are rather minimal during the summer months, with the exception of tropical cyclone activity in the Atlantic Basin. According to the United States Census Bureau the city has a total area of 26.3 square miles (68.2 km2), of which 25.2 square miles (65.2 km2) is land and 1.2 square miles (3.1 km2) is water. The total area is 4.49% water.